What do walnuts and poetry have in common? A walnut is a train is a poem is a heart is a shadow. Takashi Hiraide’s For the Fighting Spirit of the Walnut is avant-garde poetry that nevertheless relies on the most ageless of poetic devices: metonymy. But rather than create sets of parallel relations, his use of metonymy propels a seemingly endless string of shape-shifting objects and experiences. The book is divided into 111 short poetic prose sections whose splintering effect is enacted via a unique combination of speed and minutiae. Hiraide wrote most of the work while commuting, and, like train cars, its sections can be shuffled around and read in almost any order. This adds further to the associational feel, as objects, images, ideas, and memories flash in and out of view. Here’s the whole of section 91: “The young rustling breeze blowing through the trees of a borrowed landscape, beside the glass window, insists it is a migratory anticyclone. The cheerful hustler. In this spring of brute strength, you’ve tired yourself out confirming the balance between the fading halo and the boiling light. I, too, am to quickly understand, from that hoarse voice of yours, that something boiling over inside me has expended the balance of noon.” What initially reads like free association turns out to be a near-microscopic record of emotion and phenomena. To crack open a walnut is ultimately to destroy it; to unlock a poem’s secrets partially steals its life. Hiraide’s writing obstructs this intrusion, or at least seeks to defer it for as long as possible. There’s no narrative arc to the work, no resolution, no closure—to the contrary, eraser is a favorite word: “Entering the room, a pulse is taken right when the heart is crushed upon a color-printed newspaper. And so it is today, too, a line of poetry goes without shooting you, and is nothing more than a soundless watery segment floating up for the first time, finally, enfolded in the gathering dusk of a long detour.” Sawako Nakayasu’s deft translation appears in a striking bi lingual version: the English starts from the front and works its way forward, while the original Japanese starts from the back. The languages meet on either side of inverted images of a lightning strike. The mirrored texts thus mimic a walnut’s fleshy swirl, as well as productively frustrate attempts to impose a definitive order on Hiraide’s unruly poetry. I don’t particularly like walnuts—they taste woody; their texture is borderline mealy; and they ruin anything they’re added to, especially ice cream. I’m not sure how much Hiraide enjoys them either, but I bet he admires their Deleuzian folds and resemblance to a cerebral cortex. On a related note, although I like the idea of poetry, I don’t always like poetry itself. Hiraide also seems ambivalent, given the book’s assault on various conventional poetic structures. 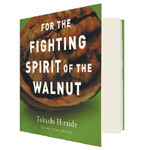 In Nakayasu’s introduction, she quotes Hiraide as saying: “There came a point when I could no longer stand to speak about poetics with those who were unwilling to consider poetry from an external distance.” A sense of resistance as a resistance to sense is fundamental to Hiraide’s approach, and is part of the walnut’s “fighting spirit.” In another book, Hiraide compares poetry to baseball. For the Fighting Spirit of the Walnut similarly doubles as a book on poetics, and specifically of the fragment borne by a poetic line where the literal lives in pieces.